I've been an admirer of the Rolex Explorer for quite some time. Its simple design has endured for fifty years and will likely remain an all-time classic. Despite my attraction to it, I've always felt that for what you get the asking price of $3,000 is a bit too steep. Yes, it has white gold hands and markers and a nice movement, but for me that's not enough to justify such a cash outlay. For the past year or so I've been keeping my eyes open for something that resembles the Rolex, but has a more relaxed price. There were a few that came close, some of which I even purchased, but ultimately none filled the Explorer void. It was a couple of months ago when I became aware of the Sandoz Explorer. There was one catch though; it was quartz. While I don't have anything against quartz, it simply wasn't what I was looking for in an Explorer-type watch. And besides, this watch proclaimed QUARTZ in massive letters right on the dial. With all of the pre-conceived notions that many have about quartz, this was like having a dirty word tattooed on your forehead. Because Sandoz has no web-presence and is a relatively obscure company, I had no idea that an automatic version of their Explorer also existed. It was with much delight that I discovered that die-hard collector Reto Castellazzi sells the automatic version for an extraordinarily good price of $129. Why this is such a good deal will become evident shortly. The Sandoz Explorer is a dead-ringer for the Rolex Explorer. Its size and shape and the curve of its lines make it virtually indistinguishable from the genuine article. 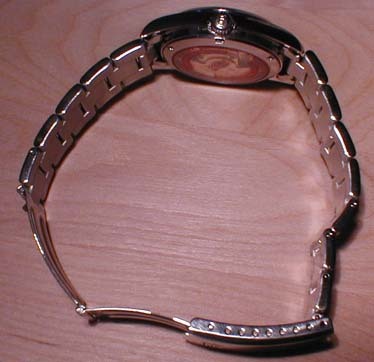 The largest visible differences are that it has Sandoz markings on it and the bracelet is somewhat lower quality. The crown is on the small side, but it isn't hard to grasp. It screws and unscrews smoothly, not exhibiting any of the "crunchiness" that is typical of lower priced watches. For an extra bit of class, the crown is signed with the Sandoz logo. The logo, by the way, reminds me a great deal of Rolex's Tudor Logo. Not knowing the history of Sandoz to any significant depth leaves me somewhat ambivalent about this. I don't know if it's coincidence that the logos are similar. It's quite possible that the Sandoz and Tudor logos were designed independently of one another. 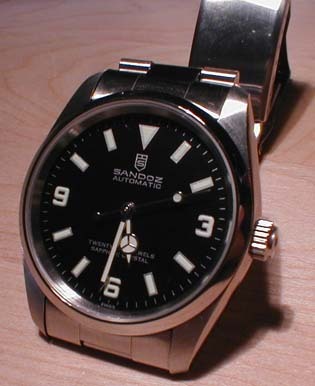 Of course, it's also possible that I'm being far too charitable and that like the physical design of the Sandoz Explorer and Submariner models, the logo was also heavily borrowed from Rolex. I don't think this really matters in the grand scheme of things. I have heard complaints that the bracelet and clasp are flimsy. I don't feel this way at all. The 2.5mm thickness of the bracelet is ideal for the size of the watch. If it were much thicker, it would start to overshadow the watch itself. The bracelet is solid, except for the endlinks, which are hollow. The clasp is pressed metal, which is signed on the inside and the outside, and is admittedly a bit thin. But I wouldn't go so far as to call it flimsy; it's sturdy enough for the job it does. The clasp is like a standard flip-lock clasp, but it lacks the flip-lock mechanism. This increases the risk of it opening while being worn, but also gives it a more streamlined dress watch appearance. If the dress watch look is what you are after, you may want to think about putting the Explorer on a black leather band. It compliments the watch very nicely. There is synthetic sapphire crystal on the front of the watch, and surprisingly on the exhibition back as well. Sapphire is much more scratch resistant than mineral glass and also more expensive. How Sandoz can cost effectively use it for both the front and back of the Explorer truly astounds me. This is one of the things that helps make this watch such a great value. The exhibition back has the great misfortune of being nearly completely obscured by large bright red writing. Why this writing is so large and so bright eludes me. It would have been a simple matter to have all the writing around the edge in a more neutral color, such as black. The end result would be the same, but more tastefully executed. The writing can, with some effort, be removed. It's on the inside of the case, so only those who are brave enough to actually open the case will be able to remove it. I have heard of a couple of people who have successfully done so with paint thinner and a cotton swab. I may do the same eventually. The movement is the popular Swiss made ETA 2824. It has all the good features that one wants, such as automatic winding in both directions, manual winding, very smooth sweeping second hand, and a hacking feature that lets you synchronize to a time source. As far as timekeeping goes, I've never had a 2824 that was more than five seconds off per day, and this one is no exception. After three days of wear, the watch has gained only six seconds, which means it's keeping time to an incredible two seconds per day. Of course, there's break-in time to be considered, which doesn't always work out for the best. I'll post an update should timekeeping take a nosedive. Like all the other ETA 2824 movements that I've handled, manual winding is firm to the extent that it is somewhat uncomfortable to do so. Keeping this watch on your wrist or on a winder is a good remedy for that. 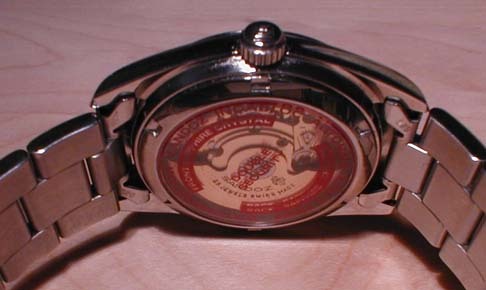 The finish of the watch is the normal oyster affair: polished sides and a brushed front. The bezel is also polished and pleasant to look at. The watch appears small, but all I can say about this is that it is and it isn't. The 28mm face is the same size that you see on a Submariner, but the case size of the Explorer is much smaller because it doesn't need to accommodate the larger bezel or endure high pressures. Those who are fond of larger watches may find the Sandoz Explorer to be too small on their wrists for their liking. The dial, which really is the watch, is very well done. Printing is solid without hollow areas or any fuzziness around the edges. Time positions three, six, and nine are in a football jersey style typeface. Noon is designated by a downward pointing triangle, and all the remaining positions are rectangles. This is all very much like the Rolex Explorer. 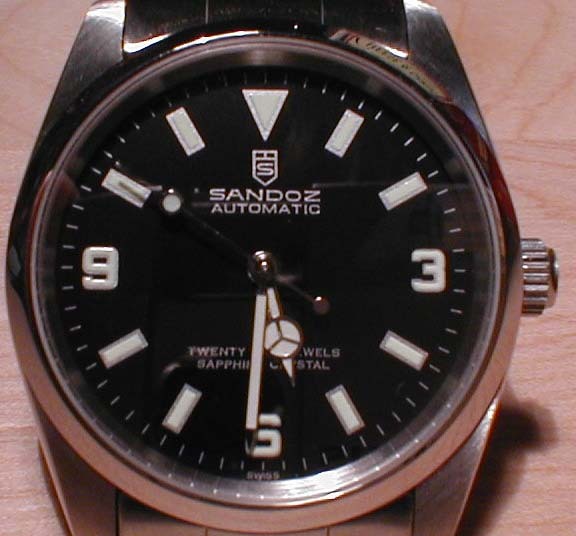 The markers on the Sandoz Explorer are similar to the older Rolex Explorer models in that they are painted on. Newer Rolex Explorers have raised white gold markers instead. Like the new Rolex models, however, the hands of the Sandoz are chrome, although on the Rolex the chrome is actually polished white gold. I have to assume that the markers and hands are filled with a tritium laced luminous compound. There is no indication anywhere on the watch that tritium is being used, but the fact that the glow persists throughout the night strongly suggests it. While tritium ensures that you will be able to see the watch in complete darkness, hours after the watch was last exposed to light, the luminous compound itself is rather weak and despite the tritium's efforts to excite it, it doesn't do well in subdued lighting. I'm not sure what the depth rating of the Sandoz Explorer is. On the back, in the bright red lettering that I spoke of earlier, it proudly proclaims itself to be water resistant, but it doesn't go into detail about to which depth this holds true. Someone suggested that because of the screw down crown that the rating is likely 100m. I'm not so sure about this. Sandoz's dive watches are rated a meager 100 meters, so it may be too much to ask for their Explorer to be rated the same. I think it may be prudent to split the difference and give it a 50m rating. At 50 meters, you can get the watch wet and even swim with it, but you probably wouldn't want to venture too far beneath the surface. That's about all I can say about the Sandoz Explorer. I rank it as one of the best watch purchases that I've ever made simply because you get so much for so little. I wouldn't hesitate for a moment to recommend it to anyone who is looking for an attractive and reliable timepiece.